Sarah Kenderdine is not an architect, but an archeologist working on numerous heritage sites around the world including China, India, Myanmar and Sri Lanka. 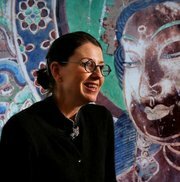 She was awarded her PHD entitled “in-situ: Immersive Architectures for the Embodiment of Culture and Heritage” and is at the forefront of new methods of digitally capturing and publicly exhibiting built and cultural heritage through interactive augmented reality in libraries, art galleries and museums all around the world. Sarah presented three talks on ’Architecture for the senses: Cultural heritage in the age of experience’ across New Zealand in April.